Son of Greek refugees from Salihli in Asia Minor and Sozopoli on the Black Sea, Tolis Nikiforou was born in Thessaloniki in 1938. He graduated from Anatolia College, studied Business Management and worked as a bank employee, a translator and, mainly, as a management consultant until 1999. He lived in London and traveled during the dictatorship, returning to Thessaloniki in 1971. 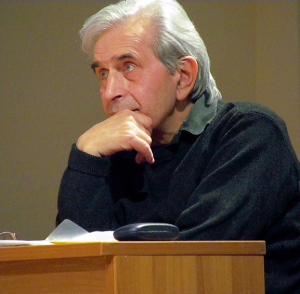 Tolis Nikiforou belongs to the second post-war generation of Greek poets. He has published 18 collections of poetry, 6 collections of short stories, 4 novels and 3 books of fable. Some of his poems have been translated into nine European languages, in the U.S.A. and Canada and have been included in several Greek and foreign anthologies as well as in High School textbooks for Modern Greek literature in Greece and Cyprus. In 1989 he was awarded the Science Fiction Novel Prize of the Women’s Literary Circle for his book “Sotosapol the gold miner” and in 2009 the State Short Story Prize for his book “The road to Ouranoupolis (city of the sky).